Pitcher with Makara-head spout. Bronze, Vietnam. Giao-Chi era, 1st c BC-3rd c AD. Photo: Courtesy Christophe HIroco (Paris). According to Howard-Sneyd, Asia Week New York launches with a private, by invitation only reception at the Solomon R. Guggenheim Museum. Contemporary artist Tai Xiangzhou shines fresh light on classical Chinese art forms as evidenced by Magnificence Within: New Ink Paintings, an exhibition of 15 new ink works, three of them in the highly coveted hand-scroll format, at The Chinese Porcelain Company, 475 Park Avenue at 58th Street. Since Tais American debut at Asia Week New York two years ago, subsequent exhibitions of his intricate masterpieces have never failed to win applause due to the sheer beauty of his work and dedication to time-honored techniques of Chinese art, with a contemporary twist. All works in this exhibition drew inspiration from a single scholar's rock, which stands a mere two inches tall and will be on view at the show. Through the auspices of Nicholas Grindley, who divides his time between New York and Beijing, lands a gilt bronze figure of Avalokitesvara, the only piece of sculpture in an exhibition of Chinese Scholars Objects at Hazlitt Gooden & Fox, 17 East 76th Street. The 17th-century figure is seated and clad in finely cast robes left open at the chest to reveal an ornately jeweled necklace above the waist-tied dhoti, the borders incised with floral scroll. On the broad face are downcast eyes and crisp features, surmounted by an elaborate tall coiffure and a tiered crown. Originally from the collection of Robert and Jean Shoenberg of St. Louis, Missouri, this was practically the only piece of Chinese art in a collection that included important African and Oceanic art and important modern American paintings. The sculpture has recently been in a private collection in Hong Kong. Chinese Works of Art & Paintings, presented by Michael C. Hughes LLC at the Mark Murray Gallery, 39 East 72nd Street, 5th floor, has as its centerpiece a rare calligraphy handscroll dated 1849 and bearing the inscription Imperial Brush, meaning that the Daoguang Emperor painted it himself. The four large characters, inscribed on a gold-leaf-flecked paper, read Yong Shou Fan Li (blessed by prosperity and happiness). Kaikodo LLC at 74 East 79th Street, Suite 14B, salutes Asia Week New York with Welcoming the Spring, an exhibition of traditional Chinese, Japanese and Korean paintings and works of art. One of the rarest paintings being offered is a beautifully preserved 12thcentury Chinese figure painting of a scholar in a spring garden setting. In addition two contemporary artists will be featured: Luo Jianwu and Zhu Daoping. At J. J. Lally & Co., 41 East 57th Street, 14th floor, extraordinary vases, wine ewers, tea bowls and other vessels produced during the Golden Age of Chinese ceramics will delight viewers at the exhibition Song Dynasty Ceramics: The Ronald W. Longsdorf Collection. Created by an American who began to acquire Chinese art more than 30 years ago, the collection includes examples from some of the most famous kilns of the Song period (960-1279). One highlight is an elegantly carved openwork Qingbai-glazed porcelain censer. Chinese Abstraction Now is Martha Sutherlands focus at her eponymous gallery, M. Sutherland Fine Arts, Ltd., 55 East 80th Street, 2nd floor. No painting epitomizes the title of her show more than Abstraction No. 4, 2007, by Zhu Jin Shi, one of the few Chinese artists to practice German Abstractionism during the Cultural Revolution and a living bridge between the China of Mao and the China of now. His painting technique is characterized by highly saturated color and almost impossibly thick impasto. Walter Arader Himalayan Arts gilt bronze figure of the Bonpo deity Kunzang Akhor stands out in his exhibition, Fine Himalayan Bronze, at 1016 Madison Avenue. This 13th-century bronze is, according to Jeff Watt, founding curator of the Rubin Museum of Art, one of the finest known works of Bonpo art and by far the largest known statue, evidencing the characteristic broad shoulders, muscular physique, honey-brown patina, and well-defined toes and fingers unique to the Khasa Malla Kingdom of West Nepal. Showing at Isselbacher Gallery, 41 East 78th Street, is Art Passages of San Francisco and its exhibition Krishna: The Divine Dalliance. Evoking a particularly compelling allure is the painting Krishna Watches Radha, circa 1760. It was painted in the mature Kishangarh style of the mid-18th century and has a wonderful mystical and atmospheric quality. Christophe Hioco sails in from Paris with An Amazing Diversity of Ancient Indian Art: Recent Acquisitions of Dong Son and Champa Pieces, on view at 29 East 72nd Street. 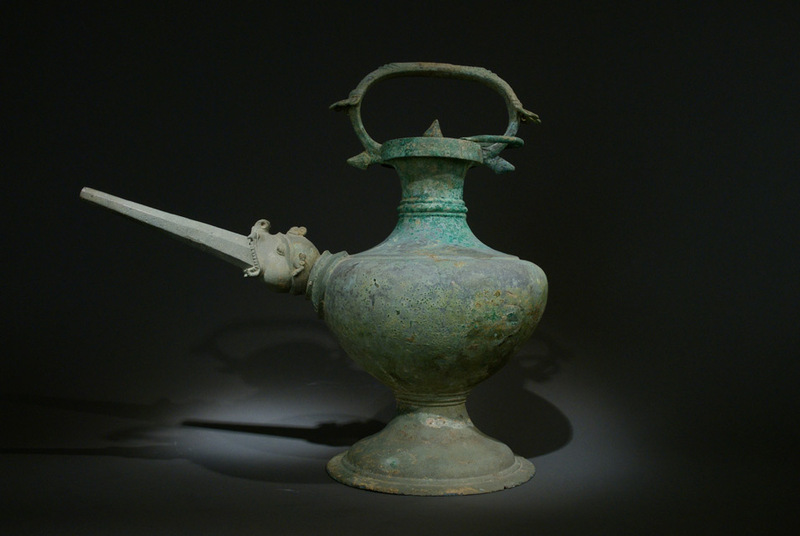 Among the best objects is an exceptional bronze Vietnamese pitcher with a makarahead spout from the Giao-Chi era, a period lasting from the first century B.C. to the third century A.D. Two similar examples reside in the Brussels Museum and the Metropolitan Museum, in ceramic and bronze respectively. Gods and Monsters: Recent Acquisitions of Indian, Himalayan, and Southeast Asia Works of Art is the intriguing title bestowed on the Asia Week New York offerings by Nayef Homsi at 1016 Madison Avenue, 3rd floor. Among the highlights is the Cult of the Stupa, a gorgeous 2ndcentury carving from the ancient region of Gandhara, depicting a donor figure and a Bodhisattva worshiping at either side of a richly ornamented stupa with a Corinthian capital motif above intertwining snakes and overflowing pots. The exhibition Indian, Himalayan and Southeast Asian Art at Carlton Rochell Asian Art, 121 East 71st Street, touts among its 25 sculptures and paintings Scenes of Milarepas Life, a late 17th-century Eastern Tibet work that was exhibited in the Rubin Museums 2009 presentation of Himalayan art from the prestigious collection of David R. Nalin. Published in the accompanying catalog, the work depicts one of the most beloved figures of Tibetan Buddhism, Milarepa, who was able to overcome the despair of a troubled youth and attain enlightenment as an adult. At Arader Galleries, 29 East 72nd Street, London's Jonathan Tucker Antonia Tozer Asian Art is mounting an exhibition entitled An Important Group of Sculptures from India and Southeast Asia. Among them is a large terra-cotta head of a Bodhisattva in Hadda style from the 4th or 5th century. The Gandhara head bears a tranquil, dreamlike expression, has wavy, swept-back hair and wears heavy pendant earrings. Nancy Wiener Gallery presents Recent Acquisitions this year at the Jack Tilton Gallery, 8 East 76th Street. Highlighted here is Krishna and Radha in a Moonlight Tryst, an illustration of the famed 12th-century Indian epic poem The Gita Govinda, which recounts the story of the god Krishnas relationship with his human lover, Radha. This exquisite folio is from the acclaimed circa-1775 series widely recognized for its unparalleled artistic excellence. The golden age of ceramic-making in Japan comes vibrantly alive in Chinese Ink/Japanese Clay: The Best of Two Worlds, presented by Dai Ichi Arts, Ltd. at Hollis Taggart Galleries, 958 Madison Avenue. The highlights include works by Nagae Shigekazu, Wada Morihiro, Kawabata Kentaro and Nakamura Takuo, whose Water Jar, made of stoneware with enamels and gold lacquer, is pictured. Juxtaposed with the ceramics are 30 ink paintings by master artist Li Huisheng. Present Meets Past: Japanese & Chinese Works of Art & Koichiro Kurita Platinum Photographs is New York-based Carole Davenports exhibition at Leigh Morse Fine Arts, 22 East 80th Street, 5th floor. Sublime platinum-palladium photographs by Koichiro Kurita create the backdrop for a selection of traditional Japanese and Chinese works of art. Round360, which atmospherically captures nature untouched by man, was executed in 2001 in Boundary Water, Minnesota, using vintage techniques and large-size negatives, Kurita's signature approach to photography. At Kang Collection Korean Art, 9 East 82nd Street, a selection of paintings, screens and scholars objects will be on view under the inviting title Royal Splendor: Decorative Court Paintings of the Joseon Dynasty (1392-1910). One of many highlights is an early 20th-century, eight-panel, ink on color paper folding screen from Korea, depicting Books and Scholar Accoutrements. Such screens were used to symbolize knowledge and wealth, particularly during the reign of King Jeongjo (1776-1800), and were found behind the desks of notable men, and of those who aspired to be such. Hailing all the way from Melbourne, Australia, is Lesley Kehoe Galleries, treating Asia Week New York visitors to Deconstructing Tradition: Contemporary Japan  Maio Motoko & Unryuan Katamura Tatsuo, on view at 41 East 57th Street, 5th floor. Pictured is Fleeting Moments, a pair of folding screens, one of eight panels and the other of five, by Maio Motoko. Through a dazzling use of antique silk textile fragments, the artist explores the diverse and momentary constituents of human existence. Objects Revered: Korean Art from American Collections, presented by KooNew York at the Mark Murray Gallery, 39 East 72nd Street, 5th floor, features choice works assembled by private mid-twentieth-century collectors who lived abroad in Korea. On view are exceptional Buddhist sculptures and paintings dating from the Joseon Dynasty (1392~1910), along with a wide offering of unique pottery and roof tiles from the Three Kingdoms Period (57 BC~668 AD). Highlights heralding from a private Florida-family collection include a rare Pair of Polychrome Wood Buddhist Attendants and a Gilt Lacquered Wood Seated Buddha. Among only a handful of extant examples to discovered in the West, these three noteworthy 18th/19th century sculptures exemplify the Buddhist devotional ritual for placing sacred texts and objects inside a reliquary statue following its carving. Concluding its year-long 35th-anniversary celebration, New York-based Joan B. Mirviss Ltd, 39 East 78th Street, has something extra special to spotlight: Seven Sages of Ceramics: Modern Japanese Masters, a ground-breaking exhibition of 40 major ceramic works that showcase the range and depth of seven modern masters of clay whose work is enormously celebrated in Japan but, until now, has remained largely unknown in the West. Pictured is a large vessel with blue enamel glazed banding created in 1976 by Kamoda Shoji (1933-1983), one of the featured artists who drew upon centuries of tradition to create a new vision of function through innovative designs that have inspired countless contemporary artists. Scholten Japanese Art at 145 West 58th Street, Suite 6D, presents Asia Week New York enthusiasts with The Nightlife: Entertainments of the Floating World, a captivating compendium of images illustrating traditional Japanese leisure activities like kabuki, sumo wrestling and taking tea at a teahouse. The highlight is a lovely small 17th-century six-panel screen that depicts female shrine dancer Izumo no Okuni, who is credited with originating Kabuki Theater, which, ironically, later became restricted to male actors only. Taisho Period Screens and Scrolls | Contemporary Sculptures by Sueharu Fukami, on view at the Erik Thomsen Gallery, 23 East 67th Street, will feature a stunning pair of six-panel folding screens, which are sure to grab the attention of Asia Week New York attendees. These screens, entitled Vying Peacocks, date from the Taisho Period (circa 1929) and are from the masterful hand of Ishizaki Koyo (1884-1947), who used ink and mineral colors on a silk ground with gold leaf to complete these masterpieces of Japanese decorative art. Each measures 67 inches tall by 190 inches wide.